Download the map and pocket guide, or pick one up on your next visit to Fort McHenry. 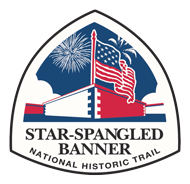 Explore the Star-Spangled Banner National Historic Trail by car and enjoy over 100 miles of scenic byway! For great views of the Eastern Shore or upper Chesapeake Bay, follow the Chesapeake Country National Scenic Byway or Lower Susquehanna Scenic Byway. Keep an eye out for the Trail’s sign along the way, marking the route of the driving trail and directing you to sites related to the War of 1812. Where can I bicycle the trail? You can bicycle along some of the roadways that the trail follows, or along one of many multi-use trails that intersect the trail’s auto route. Mount a bike rack on your car – you’ll find plenty of parks that are best experienced from a bicycle. And remember to wear a helmet! How do I get to the water portions of the trail? The Chesapeake Bay and the Potomac, Patuxent, and Patapsco, Rivers, among others, are all part of the trail. You can launch your boat from public access ramps and docks along any of these waterways. Some public access points, such as Lower Marlboro, Maryland, offer fishing and water views. Guided tours and boat rentals are available in waterfront communities including Solomons, Havre de Grace, and Chestertown. Eight NOAA buoys in the Chesapeake Bay Interpretive Buoy System provide brief narrative remarks by Ranger Victor Markland of Fort McHenry. You can listen to the narratives over the telephone (dial 877-BUOY-BAY and choose the “geography” track), or read the narratives online at www.buoybay.noaa.gov. Get out on the Star-Spangled Banner Trail and take advantage of the numerous learning and recreation opportunities! Paddle, pedal, or picnic at more than 160 locations throughout the Chesapeake Gateways and Watertrails Network. The network’s water trails, parks, museums, wildlife refuges, and historic sites offer hands-on, family-friendly opportunities to explore the Bay. Embark on an adventure along the Star-Spangled Banner Geotrail. Get your NPS Passport stamped at more than 10 locations along the trail. Walk the same roads British troops walked and see the landscapes they saw between Benedict, Maryland, on the shores of the Patuxent, and Bladensburg, Maryland near Washington, DC. Hop a ferry to Tangier Island, Virginia, from Crisfield, Maryland, or Reedville, Virginia and explore the island by bike or kayak, which you can rent from the Tangier History Museum and Interpretive Cultural Center.